This luxurious vanilla candle from our Aroma-botanicals Collection contains familiar notes of Vanilla and Tonka Bean absolute, skilfully combined with Cedarwood, Lavender, Geranium and Ylang ylang essential oils to create a beautiful vanilla-floral fantasy in your home. 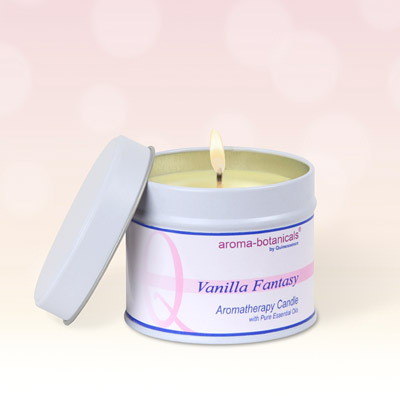 The warm and creamy aroma of vanilla unites with the floral notes of the other essential oils to produce a soothing and relaxing aromatherapy candle you won't want to be without again. Housed in a contemporary re-usable aluminium container to retain the aroma, we use a 100% soy wax blend for a healthy, cleaner burning, and toxin-free aromatic tin candle. No smoke, no soot, just a beautifully fragrant experience, and sure to bring pure delight to absolutely any room in your home. Please ensure that you use a suitable heat resistant surface when the candle is lit.